Around this household artichokes are ranked OK, but aren’t a really big favorite—but we would like to try them to see how they are when they’re picked young, small, and tender instead of big and pithy as they always appear in supermarkets. Unfortunately, this is not an easy climate for artichokes, which prefer mild, damp weather (some sources say it won’t grow below Zone 7). In earlier editions of this page, we cited a long roll call of demonstrations that these babies just won't grow here, but this time we’re skipping that and taking it as read. The answer for folk like us in short-season, hot-summer/cold-winter climates is to grow the plants as annuals, choosing cultivars bred expressly to be so used. There are two such (both bred by a gentleman named Keith Mayberry, who deserves much credit); they are the original one, Imperial Star, and a more recent one, Colorado Star (which is purple, not green). Though we are not growing them this year (because we are doing a major-re-working of our garden and this is not essential to us), next season we will try the Colorado Star, because it is a bit earlier even than Imperial Star. It is quite important with this vegetable that it be started as seedlings indoors then transplanted out so as to get, from day of transplant, at least ten days of temperatures from 45° to 50°, but not frost. The seedling growth period prior to transplant can be from 6 to 12 weeks. In our case, that means transplanting some time in March, typically around the end of the month, which sort of fits the classic “as soon as the ground can be worked”. If we assume an allowance of 12 weeks for seedling development, that means starting seeds indoors pretty much right after New Year’s, which is thus the earliest thing on our garden calendar. Sow your artichoke seeds about ¼ inch deep and ¼ inch apart in a lightly moistened soil-less growing mix. Use a good-quality starting mix, not hardware-store “potting mix”: you want a soil-free medium, to be sure there are no fungal problems (“Jiffy Mix” and “Pro-Mix” are representative examples of the sort of thing wanted, and many mail-order garden-supply houses have a proprietary mix). Germinate the seed at a temperature of about 75° F.: heating pads or the like under the seedling flat or pot are an immense assist to good germination. Be sure to start more seeds than you want plants, perhaps half again as many, because you will likely have to cull them at planting-out time. As soon after emergence as the individual seedlings can be handled, transplant them into fair-sized pots or cells—say 4" for pots or 1½" for cells. Keep those transplants growing at temperatures as close as you can get to 65° in the day and 55° at night; the day and night temperatures can be plus or minus 5 degrees, but try to keep the day/night difference at around 10°. Site your artichoke bed where the plants will get at least 6 hours of sun, as they will not develop properly without it. Artichokes need really good soil to thrive: fertile, and well-drained. Before planting out your seedlings, spade the ground deeply and supply it with good compost or manure (and fertilize again, generously, every season). If your soil is heavy (clay), work humus or even sand well into it. Slightly acid soil is wanted for artichokes—some say even as acid as pH 6.0 (though others say 6.5). We have seen spacing recommendations from up to 6 feet down to 2 feet; as this type is small for an artichoke, 2 to 3 feet will suffice, depending on how hard you want to crowd them. In general, while the overall number of artichokes is increased with narrow spacing, the average size of the chokes is reduced. It also depends in part on your soil: the better it is, the bigger the plants will grow. A test planting at a 3' spacing seems logical; depending on how that does, maybe the next season you can try 30" or 2', whereas over-close plants are a problem. But one way or t’other, even these fellows do eat up garden space. As noted, the transplanted seedlings require vernalization. Study your temparature data carefully, because it will usually be a close-run thing to get the temperatures low enough for vernalzation (45° to 50°) without leaving them frost-bit at night. Chances are you will have to risk the frost to get the vernalization, so see if you can give the transplanted sedlings some night-time temperature protection, as you might later on for tomato seedlings: Walls o’ Water, or soda bottles filled with hot water, or stones or bricks placed near the stems—that sort of thing. Artichokes need to grow quickly to be choice and edible. Watering is very important: one source says that with a good supply of moisture, they can yield from one to two dozen buds (artichokes) a plant). Remember that these chokes will be small (typically 1 to 3 primary buds are produced that are 2½ - 3½ inches in diameter, with the first the largest, followed by 5 to 7 secondary buds growing out from lower on the main stem and ranging from 2 to 2½ inches): don’t wait for them to reach the size of supermarket artichokes, because they won’t. Expect about 75 days from transplant to start of harvest. When the plants die down, probably in October, just pull them out. Frequent—perhaps monthly—side-dressing with a high-nitrogen fertilizer is wise. 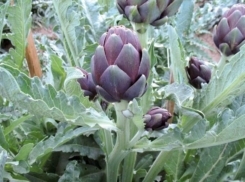 When flower buds first become visible, start checking the plants daily; pick buds just before the bracts begin to open: it’s important to pick an artichoke when the bud is still closed. Delaying harvest causes buds to mature and transform more of the desired “heart” into spiny “choke”. The chokes should be soft, and bendable for two or three inches below the bud. After a bud is cut, the plant will produce new buds that are somewhat smaller. You will not find such smaller buds in supermarkets, but it seems expert consensus that small, young artichoke buds are substantially better eating than the older, large ones typical of supermarkets. When harvesting, have a care: these plants are quite spiny. Wearing work gloves and long sleeves is advisible. Note that the purpling may vary from plant to plant: some buds will be all purple, while others may only show purple-tinged bracts (“leaves”). Note! Artichokes notoriously do not pair well with wine! If you’re eating artichokes, drink beer. The “globe” artichoke is a thistle, a perennial member of the Asteraceae (formerly Compositae) family, the asters, which also includes lettuces, cardoon (a close relative), sunchokes, and sunflowers. The artichoke proper is actually a flower head or bud that has not completely matured. When fully matured and opened, the inedible bloom, a brilliant bluish-purple thistle, can be as large as four or five inches in diameter, some even as large as seven inches across. What is commonly called the “leaves” are actually bracts. The edible portion of an artichoke “leaf” is at the base of the bract where it attaches to the heart or stem. The plant itself, as an herbaceous perennial where the climate allows, can grow to a height of ten to twelve feet, though commercial plants range from four to six feet in height and spread to a bushy six-foot diameter. Each plant produces small, medium, and large artichokes, with the largest formed at the top of the terminal buds along the central stem; smaller artichokes develop on lower branches. It appears the artichoke was first developed in Sicily. It dates back to at least the time of the Greek philosopher and naturalist Theophrastus (371-287 B.C. ), who wrote of them as being grown in Italy and Sicily. The ancient Greeks and Romans considered artichokes a delicacy, and also an aphrodistiac. In Greece, the artichoke was especially considered an effective means to secure the birth of male children. Wealthy Romans enjoyed artichokes prepared in honey and vinegar and seasoned with cumin, so that the treat would be available year round. Somewhere about 800 A.D., North African Moors begin cultivating artichokes in the area of Granada, while another Arab group, the Saracens, became identified with chokes in Sicily. That may explain why the English word artichoke is derived from the Arab al’qarshuf rather than from the Latin cynara. Between 800 and 1500 A.D., the artichoke was gradually transformed—perhaps in monastery gardens—into the plant we know today. After Rome fell artichokes became scarce, but the plant re-emerged during the Renaissance in 1466, when the Strozzi family brought them from Florence to Naples. From there, artichoke cultivation gradually spread to other sections of Europe. The artichoke arrived in Britain around 1548 (but was not well received). In the 1600s, Spanish settlers brought artichokes to California, but they did not become widely grown or used there until the 1920s—yet by 1929 artichokes were the third-largest cash crop in the Big Valley. Castroville, California—the self-proclaimed “Artichoke Capitol of the World” (it produces 80% of all commercially grown artichokes), through which we have many times passed, with pleasure—and the artichoke itself really made it onto the cultural map when Marilyn Monroe was crowned Artichoke Queen in 1948. In an on-line artichoke-eaters’ survey (6,475 participants, not trivial), almost six percent said that their "favorite part of" the artichoke was neither the heart nor the leaves. Moral? Don’t be so sure you know how best to cook and eat artichokes. You loaded this page on Friday, 19 April 2019, at 16:42 EDT. It was last modified on Monday, 28 January 2019, at 01:43 EST.